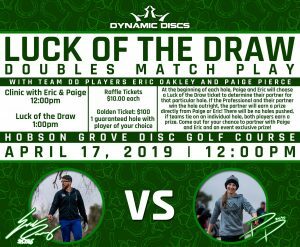 Luck of the Draw Skins Match is your chance to play with a World Champion or Top Professional: Paige Pierce, Eric Oakley, Eric McCabe, Paige Bjerkaas! Not all will be present at each event. The format is as follows: At the tee pad of each hole, each of the champs will draw a ticket, and that person will be partnered up with said champ for that hole! If the hole is won out right, the team will win the skin and the prize. If the hole has a two-way tie, then the two teams will split. If ALL three teams push, then the winner of that hole will be the team that was CTP on their drive. No skins will be pushed – there will be a winner or winners on each hole! The raffle tickets will be sold approximately an hour before the skins match begins, or online and then a 30 minute Q&A will begin right before the skins start, so make sure to be there early! When you buy raffle tickets, keep in mind you can also purchase a “Golden Ticket”, which guarantees the ticket holder will play one hole with the champ of their choice! Prizes: The partner of the champ that wins the skin will win a custom disc that their Pro partner will sign. These are exclusive to the Luck of the Draw events and will be a great collector disc! Additional prizes: At the conclusion of the final hole, we may do a small raffle with the remaining tickets so that people whose tickets didn’t get drawn will have a chance to win something and walk away with something awesome! 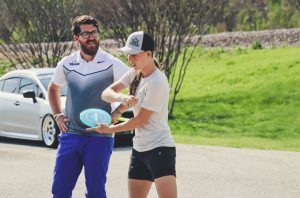 Also after the raffle and conclusion, the champs will be around to socialize and will have some fundraiser discs available for sale, so make sure you stick around and help support them as they travel the country growing the sport!